Holiday Grandeur: Luxury is now sky high! Located right in the heart of the city, but at the same time away from its hustle and bustle, ‘Grandeur’ is for those who seek the best in life. 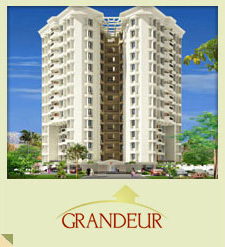 ‘Holiday Grandeur’ offers luxury apartments with 2 and 3 bedrooms, which bring quality to life. ‘Grandeur’ has G+ 13 floors with artistically crafted living spaces without common walls. Each apartment has large balconies that give you a wider and aesthetic view of the scenic vicinity. Gandhinagar is the most sought after location in the city with easy and instant access to shopping malls, hospitals, health and fitness centre, educational institutions etc. ‘Grandeur’ comprises 52 luxurious and well-designed apartments with a whole range of modern amenities that make your living enjoyable and peaceful. Some of the major facilities provided at ‘Holiday Grandeur’ include swimming pool, club with multi-gym, association room, recreation hall, kids garden, common toilets on ground floor, elegant and spacious entrance lobby with ornate false ceiling and cornice work, cable T.V connection in each apartment, generator backup for common area and lift, generator backup for all apartments up to 740.watts (without AC), intercom facility, maximum cross ventilation / natural lighting, covered car parking, fire protection system, sauna, visitors room, provision for car wash, Laundromat on roof top. The apartment will also have 24 hour security staff.